When Legendary Entertainament launched its comics division last year, it was for the opportunity to release stories like the upcoming THE TOWER CHRONICLES. 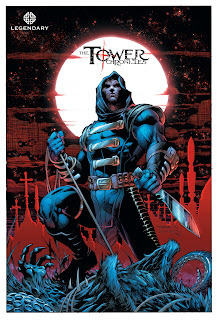 With a lead character created by Legendary founder Thomas Tull, Executive Producer of 300 & The Dark Knight, and developed by Tull and Matt Wagner (Grendel, Mage), THE TOWER CHRONICLES creates a new mythology on familiar worlds through a unique take on the bounty hunter storyline. The all-new IP sets the standard for future releases from Legendary. At C2E2 this past weekend, Bob Schreck, Editor-in-Chief of Legendary Comics, revealed the cover art for the first book of the trilogy (art is attached). Created by Jim Lee the cover showcases the supernatural bounty hunter in a menacing pose following the annihilation of one of his foes. Lee is the first in a line of world famous artists who have created covers for the series, which hits stories this September. Be on the lookout at for more information on THE TOWER CHRONICLES at San Diego Comic-Con.